system on cluster nodes eventually hangs and hadn't released resources. So we had to create test cluster without NFS shares and any NAS/SAN appliances. We have three virtual machines, one is a Web tier with load balancer functionality and the other two are SOA 11g cluster nodes. Roles and links between servers you may see on the diagram below. We should start from preparing block device to publish as iSCSI target. Unfortunately we haven't any free block devices on this server and there are no ways to add new drive or recreate partitions on existing system, so let's create block device from a regular file on an existing file system of web server. At this point we a ready to publish our device as shared storage. For our cluster we use Oracle Enterprise Linux 5 Update 5 64. All services for our system was already installed, if you are going to use another linux distributive, you shoul check existence of services and packages. For example for RHEL 4U8 you have to install OCFS22 packages and probably iscsi-target service. We ca see new disk device on nodes without any partitions and file systems. Make new partition from the first (1) sector to the last one and save the changes. When new filesystem will be created we can do next step and configure Oracle Cluster File System. We are going to create new OCFS2 cluster on servers node1 and node2. We can edit ocfs2 configuration files in /etc/ directory, or we can use utility ocfs2console. Let's decide which servers have to have access to new shared resource. OCFS cluster is not related to any other clusters - SOA, Weblogic, RAC and any others. In general, OCFS Cluster is named list of hosts to share disk resource (-s) to create a new cluster let's use standard GUI tool - ocfs2console. Form main menu select Cluster then Configure Nodes. Add all participant nodes to cluster members list. Save changes and select Cluster -> Propagate Configuration …If you have trusted relations between nodes OCFS configuraion will be copied to all members. I use to set volume labels. It allows me to be device name agnostic (and Linux loves to change device names for some secret reasons). Use ocfs2console select menu Tools/Change Label … assign partition label (SOA). Now we are ready to mount our device on all nodes and enables OS auto mount during startup. You should repeat this steps on all OCFS cluster participants. 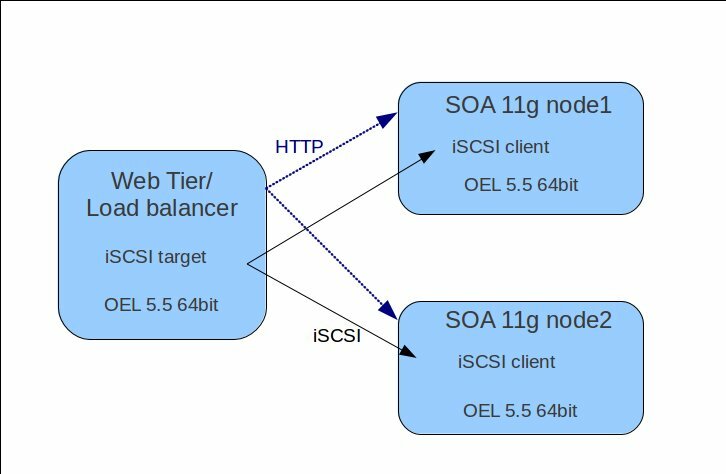 Now you have your simple shared disk system and could continue with SOA configuration. Usng this approach you can create shared storage resources quick and simple with no additional costs. By the way I do not recommend to use this configuration outside POC systems or demo stands when you have to use 2 laptops to demonstrate SOA Suite in action. This document was created several years ago in Russian so any comments, corrections are most welcome.